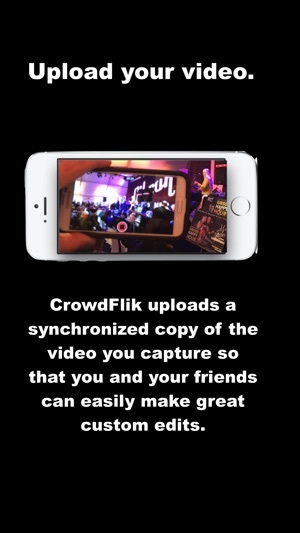 CrowdFlik is the patented mobile video synchronization and collaboration platform and is the fastest and easiest way to edit and share multi camera videos on your iPhone, iTouch and iPad. With CrowdFlik you can create custom, multi-camera videos and share them with your friends via Twitter, Facebook, Instagram, Tumbler, email, text and more. Bands, brands, sports teams and more are finding that CrowdFlik makes it easy to create and share great video content from their shows, events, parties and weddings - fans and friends are loving it!! 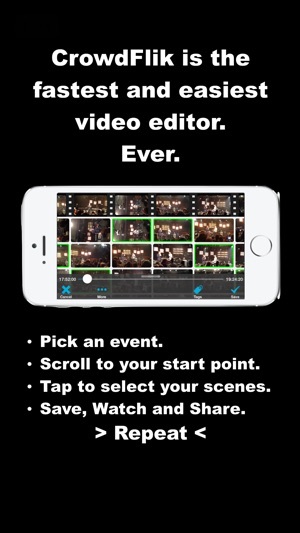 Now anyone can easily create multi-angle videos from virtually any event. 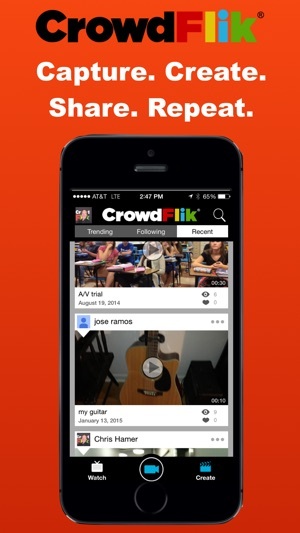 CrowdFlik is the mobile video app that allows you to edit, share and view mobile video on your smartphone. CrowdFlik automatically synchronizes and organizes shared copies of captured video streams and gives users the power to easily create multi-angle, shareable video compilations of your favorite moments from your favorite events. CrowdFlik automatically synchronizes and organizes the shared video so we all can use it to create and share the edits (FLIKs) that we want. The CrowdFlik team believes that ‘best-of' edits are too generic and that everyone deserves their own ‘Best Edit’ - or many of them. With CrowdFlik you can easily and quickly create and share as many edits as you desire and they can be as short as 10 seconds or as long as the entire event. CrowdFlik automatically synchronizes and organizes multiple video feeds and gives users a simple way to create and share best-of-edits. You can create as many as you want and they can be as long - or short - as you want. Sports teams, bands, concert promoters and brands are embracing CrowdFlik as a platform to connect fans’ event video to the brands and events. 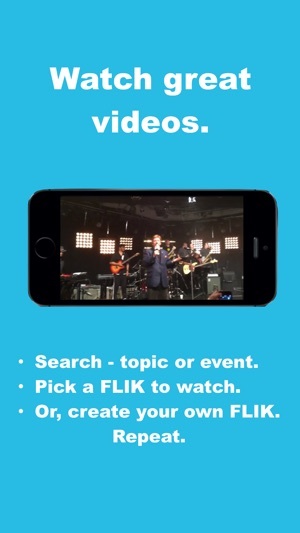 Whether you’re at a birthday party, wedding, soccer game or concert be sure to open the CrowdFlik app and film away. It's super easy. 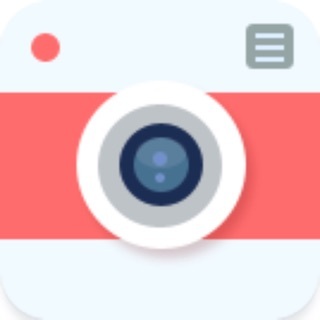 Your video will be saved to your camera roll AND you and others will be able to create and share edits from all the best angles. CrowdFlik puts you in the director’s chair allowing you to create, view, save and share multiple custom edits of synchronized crowd sourced video. How do I use CrowdFlik? CrowdFlik is very easy to use. 1) You probably already know how to download a FREE app. Pretty easy. 2) Open the APP and log in using Facebook, Twitter or Google+. Also pretty easy. 3) When you are ready to record video – simply tap the record button in the app to open the native video camera in your device. CrowdFlik automatically uploads a copy of your video and saves a copy to the camera roll. CrowdFlik is pretty smart – the upload won’t happen until you get to a WIFI zone so that you won’t blow through your monthly data plan. You can change this in the 'settings' if you want. 4) Since CrowdFlik synchronizes multiple devices based on location-based event - the app will prompt you to confirm the event that you are attending (or to create a new event) so that you and others are all sharing video of the same event. 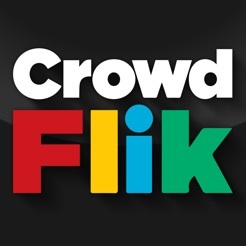 5) Record and share more, and more, and more…..
1) Find the CrowdFlik Event in the app. 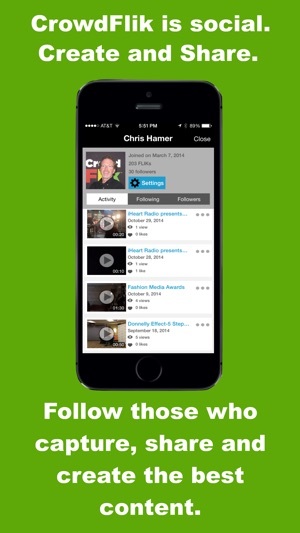 2) Tap ‘Create FLIK’ to see the organized video from the event. 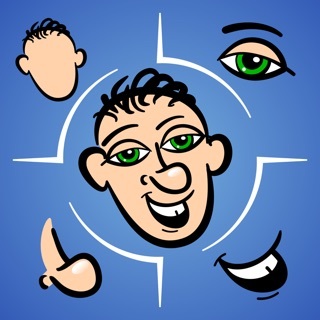 3) Tap the desired segments to create your FLIK. You can tag, save, share and more. 4) There really isn’t a #4 – just keep creating, tagging, sharing…………..
Every time you open CrowdFlik, you'll see new FLIKs from exciting and interesting events near you and around the world. Got questions, issues, or feedback? Contact us at info@CrowdFlik.com. Give me more information, please! So, do you have a real support page? Can you give me more information about how the app works? I understand the Network Time Protocol, so I am *VERY* interested to learn just exactly what you mean by "pinging the US Naval Observatory Atomic Clock". I also have a friend who is in a band, and they would be ideal partners for an app like this -- if you had a good way to capture the audio direct from the sound board at the venue, as opposed to whatever … poor quality … audio might be captured by the built-in microphones on the various devices. So to work the app just create an event and name it whatever. Have your friends join. Then start filming. Hit exit after you finished then go to the activity tab on the bottom and search for the event with the magnifying glass tap your event then hit create flick. Tap the flicks you want and bobs your uncle you've got yourself your first of many fliks. Check-in to / create events or whatever, finds other crowdflik users around you, share videos, and direct your own using your fliks or others. Yea, pretty pimp! 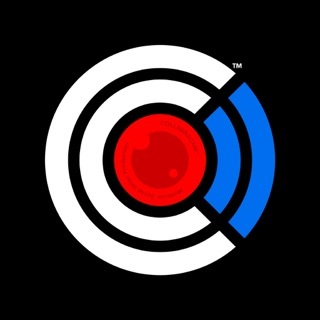 © 2012 - 2015 CrowdFlik, Inc.